We garden for various conditions and reasons, from sun to shade, as well as movement, color, and the joy of working in the garden for exercise, plus food and beauty. I’m sure you could add to this list. Raise your hand if you garden for butterflies. With a few additions, you can have a butterfly garden with a buffet of various nectar and host plants. To have a fully sustainable butterfly garden, you need more than nectar-rich plants. Often those same plants are also host plants. As you get ready for summer butterflies, evaluate a few critical host plants needed to sustain a butterfly’s life cycle. Plant pretty, nectar-rich flowering plants that are suited for a butterfly to alight. The adults you see in your garden need a sip to keep up their energy. Now plan to keep them around to lay their eggs on specific or not specific host plants. Here are five to consider, and please note, they aren’t all flowers or herbs. Some are even trees. As we know, native milkweed, Asclepias spp., is the only host plant for the monarch butterfly. There are several great species to match most any condition. Just remember, even though you can choose colors of milkweed to complement your garden (and other host plants), the ultimate goal is to have the plant eaten to the nub. That’s a sign of a lot of caterpillar activity. Black swallowtails are highly attracted to dill, Anethum graveolens, as well as parsley, fennel, carrot, and other plants in the carrot family such as Queen Anne’s lace. An attractive plant typically grown for its culinary uses, dill is lush with feathery, aromatic green leaves and yellow buds. This herb can get tall, reaching up to four feet, all the better to feed many. 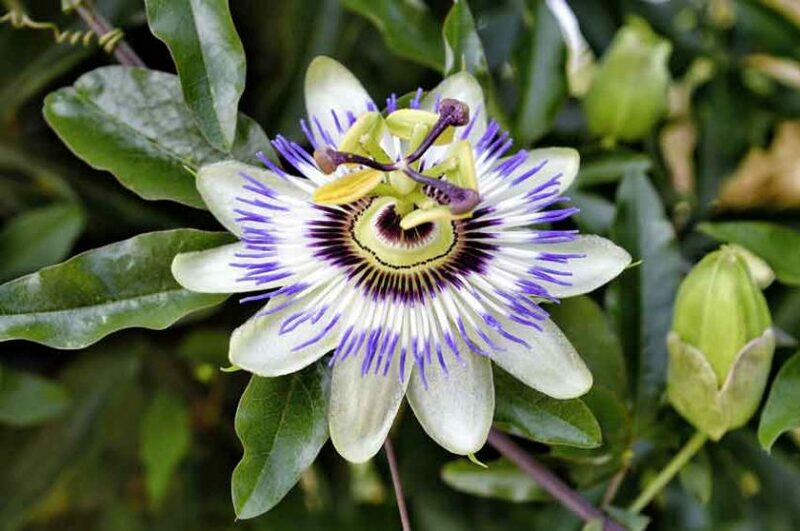 In my garden, I grow passionflower vine, Passiflora spp, reaching up 15 to 50 feet and thrives in full sun or part shade. Passionflowers host several fritillary caterpillars; a couple of common ones are the gulf fritillary and the variegated fritillary. But if you want to sustain a family for the great spangled fritillary, you must provide Violas as a host plant. Yes, that common blue violet that gets in the lawns. I like them, and leave them as their only host butterfly plant. Don’t let rust deter you from growing hollyhocks, Alcea spp. These old fashion plants are the host plant for the painted lady butterfly. Plant these in full sun. Give hollyhocks good air circulation; this may help with rust development. Willows, Salix spp., are known to grow up to 100 feet tall depending on species. If you are looking for smaller willows, try Dappled or Flame willow, which are better sized for average residential gardens. Several caterpillars like to munch on willow trees, including the red-spotted purple, viceroy, and mourning cloak. Ready to take butterfly gardening to the next level? By incorporating some of these plants you will attract a wider variety of butterflies to your garden. And now they are likely to stick around your garden.